Home to the world-famous Tribeca Film Festival, Tribeca (also sometimes spelled stylistically as TriBeCa) is an upmarket neighborhood in Lower Manhattan, New York City. 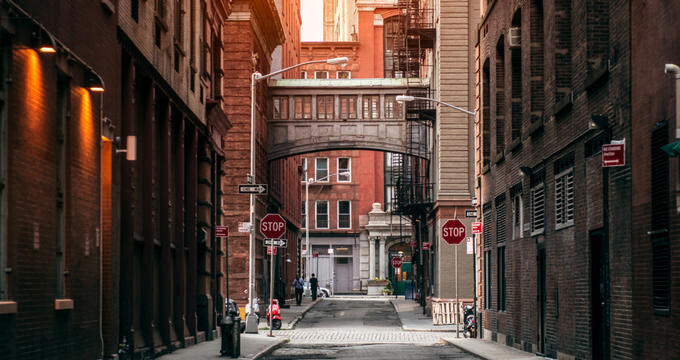 Rated as one of the most expensive districts not just in the Big Apple, but in all of the United States, Tribeca has a fascinating history behind it and is classed as one of the most popular and vibrant parts of the 'City That Never Sleeps'. First of all, let's take a look at where the name of Tribeca actually comes from. In order to understand the name of this neighborhood, we have to break it down into its three individual syllables: Tri, Be, and Ca. The Tri stands for Triangle, Be stands for Below, and Ca stands for Canal Street, meaning that Tribeca is designated as the 'Triangle Below Canal Street'. On a map, this New York City neighborhood is actually more of a trapezoid form than a perfect triangle, but the name of Tribeca was invented back in the 1970s and has stuck over the years. It was formed in a similar way to other New York neighborhoods like Soho, Noho, Nolito, BoCoCa, and more. Once nothing but farmland used for agricultural purposes by Dutch settlers, Tribeca grew and evolved over the years, with warehouses and factories being built in the 1850s and cementing the area as a key hub for manufacture and industry. Years later, those same old factories and industrial buildings were transformed into beautiful lofts and world-famous restaurants, with Hollywood stars like Robert De Niro even investing in the area and owning two Tribeca eateries. Tribeca can be located beside Soho and the Financial District of Manhattan, running from Canal Street to Vesey Street from north to south and Broadway to the Hudson River from east to west. As previously mentioned, this was once a highly industrial part of New York City but is now seen as one of the trendiest neighborhoods in town, with luxury lofts and living spaces up and down every single street. The likes of iconic pop star Beyoncé and countless other celebrities including Mariah Carey, Daniel Craig, Leonardo DiCaprio, Lena Dunham, and Jay Z all have homes in Tribeca, with property and rental prices being extremely high in this area. The average income of a Tribeca resident is around $200,000 and rents can get up to $5,000 for a simple studio, with flat-out purchase costs of a typical Tribeca home being upwards of $3 million. Tribeca is a popular tourist hotspot in New York, with many people content to simply walk around, admiring the historic buildings and stylish apartments owned by some of the world's most famous stars and celebrities. Luxury hotels and forms of accommodation can also be found in Tribeca, and the neighborhood is home to some of the finest dining experiences in all of New York City, including Robert De Niro's incredible Tribeca Grill, which often plays host to various celebrities on a regular basis, and De Niro's co-owned Japanese joint, Nobu, serving up world class sushi. Music bars and cocktail lounges can also be found around Tribeca, which enjoys a thriving night life scene, and the local park, Washington Market Park, is fitted with a popular playground for families along with basketball and tennis courts too. This Manhattan neighborhood is known for being the home of one of the cinematic world's biggest film festivals. The Tribeca Film Festival is held each year and got started back in 2002 by Robert De Niro himself. The festival was actually organized in response to the 9/11 terrorist attacks that destroyed the World Trade Center buildings, killing almost 3,000 people and injuring countless others, as well as having a huge and long-lasting effect on the city of New York and the neighborhood of Tribeca in particular, which is located near the site where the Twin Towers once stood. The first Tribeca Film Festival was highly successful and celebrated the Big Apple on the whole, and the festival has grown and grown in the years since then, attracting more attendees, more submissions, bigger media coverage, and greater respect from the film community. The film festival offers award for best actors and actresses, as well as documentaries, filmmakers, narrative features, screenplay, cinematography, and more, and puts a huge focus on shining the spotlight on smaller, independent films that might not get big audiences without the help of film festivals like this one.